When is tube feeding necessary? 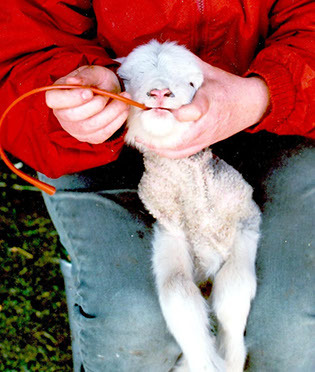 If an animal is too weak or otherwise unable to nurse, it needs to be tube fed. Other situations include maternal factors (lack of milk production, lack of mothering, mastitis, death) and management decisions to control various diseases (C.A.E., O.P.P., Johne’s disease, etc.). 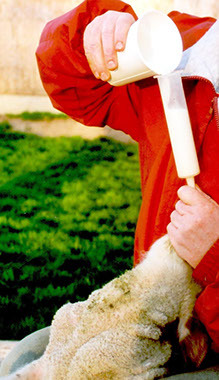 If the lamb or kid will drink from a bottle, this is always preferable to tube feeding. Colostrum is the first milk of a mother’s lactation period. It is produced by the udder in the last weeks of pregnancy and lasts for a few days after delivery, decreasing in quality as the mother’s milk comes in. It is usually thicker and more yellow than milk. It contains high levels of fat, protein, vitamins and special proteins called antibodies. These antibodies are produced by the dam’s immune system to protect her against various diseases such as tetanus, enterotoxemia, E. coli and other diseases she was vaccinated against or experienced naturally in her life. Giving dams a booster vaccination three to four weeks before kidding or lambing helps ensure high levels of antibodies in colostrum. Newborn animals must ingest colostrum within a few hours of birth. A newborn’s intestinal tract is not very selective in the first hours of life; antibodies can be absorbed whole, which is essential for their function. After 12 hours of age or so, antibodies and other proteins are digested into amino acids and then absorbed; they can be used as a source of nutrition but no longer have any systemic disease-fighting ability. The 12-hour time limit should be considered an absolute maximum—producers should strive to ensure adequate colostral intake as soon as possible after birth. Sources of colostrum in decreasing preference include the neonate’s own dam, another dam of the same species and disease status in the herd, frozen colostrum from the same herd, and commercial colostrum replacer. Commercial colostrum supplements are available to boost the quality of poor quality colostrum. Each year, producers should harvest surplus early colostrum from high-producing animals and freeze it in case of emergency; update frozen colostrum reserves every year. Freezing colostrum in two-ounce portions simplifies future use and reduces waste. Laboratory tests can confirm the quality of a sample of colostrum by measuring its antibody concentration. Blood tests in neonates over 24 hours old can confirm whether or not they have absorbed sufficient levels of antibodies. The lack of a protective level of circulating antibodies is called failure of passive transfer (FPT). FPT makes a young animal very susceptible to disease; many animals with FPT die of scours or pneumonia within two weeks of birth. After the first 12 to 24 hours of life, the gut is “closed” and can no longer absorb intact antibodies, so the only treatment for FPT is a costly intravenous transfusion of plasma antibodies. 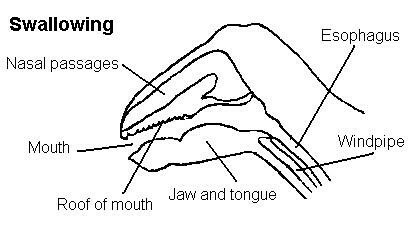 The diagrams below depict a simplified cross section of an animal’s head. 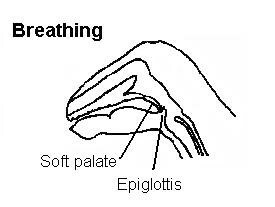 The “Swallowing” diagram shows the structures of the throat area during swallowing and the “Breathing” diagram shows the same structures during breathing. During swallowing, food and liquids are funneled down the esophagus instead of into the airway by the automatic function of protective flaps of tissue. Graphics adapted from page 340, Sheep Production Handbook (American Sheep Industry, Inc., 1996). Used with permission. All rights reserved. 1. Determine that tube feeding is necessary. 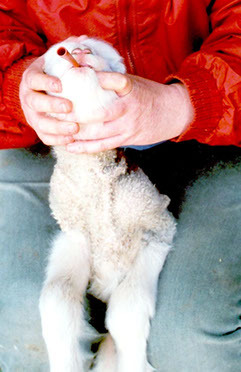 If a newborn lamb or kid has not nursed within 4 hours of birth, it should be offered a bottle. If an animal is nursing or can take a bottle, there is no need to tube feed. 2. If the animal is hypothermic (cold), warm it before administering colostrum. Neonates must be warmed before colostrum can be absorbed properly. Stick a clean finger in the animal’s mouth—if it seems cool, the animal needs to be warmed. Take it indoors, fashion a wool sweater for it, put it under a safe heat lamp, place it near a wood stove or do whatever it takes to warm it until the mouth feels warm. A moribund animal may need to be immersed in warm water for rapid warming. Dry all neonates thoroughly before putting them outdoors. 3. Warm the fluid to be administered to about 104ºF. There is no need to feed colostrum if the animal is older than 24 hours old—milk will do. Electrolytes should be administered if the animal is weak due to dehydration from diarrhea. Frozen colostrum should be thawed in a warm water bath, not a microwave; microwaving destroys the beneficial and protective antibodies in colostrum. 4. Assemble sanitized equipment, including a feeding tube and a 60-cc dose syringe. Tube feeding kits are available through livestock catalogs and farm supply stores. An open ended, 0.4 meter-long piece of soft, flexible polyethylene tubing, six millimeters in diameter, with a smooth end is a safe and effective stomach tube. 5. Place the tube alongside the neonate’s body, with the mouth of the tube at the animal’s mouth and the end at its last rib, where the stomach is located. Note how far the tube will have to be inserted to reach the last rib. 6. Sit in a chair and restrain the animal by facing it away from you, gently holding it by its shoulders between your knees; the animal’s body will dangle down between your legs. If an assistant is available, she should hold the animal by the shoulders and let its body dangle. Never tube feed an animal on its side or it may inhale the fluid you are administering. 7. Hold the animal so its head is in a normal position. Dip the tip of the tube in clean water and slowly insert the tube in the animal’s mouth. There is no need to use pressure or force, just gently advance the tube toward the back of the animal’s mouth. The animal should swallow the tube readily and you can see the swallowing motion if you watch carefully. THE GOAL IS TO INSERT THE TUBE INTO THE ESOPHAGUS, NOT THE TRACHEA. If the tube enters the trachea (windpipe), the animal should cough, gag and react violently, but a moribund animal may not react. An animal that has correctly swallowed the tube can still bleat and cry; an animal that has inhaled the tube cannot make these noises, but should be objecting strenuously to the tube in its trachea. BEST METHOD: Attach a 60-cc dose syringe to the mouth of the feeding tube after it has been fully inserted into the animal; pull the plunger back. As shown in the photo, if the tube is placed properly, it should be very difficult to get the plunger to move past a few cc marks. This is because the negative pressure created when the plunger is pulled back will cause the thin muscular walls of the esophagus to be pulled against the hole in the end of the tube, blocking any air flow in or out of the holes in the tube; also, there normally isn’t much air in the esophagus or stomach. If the tube is improperly placed and is in the trachea, it will be very easy to pull the syringe’s plunger back. This is because the trachea has sturdy cartilage rings and can withstand the negative pressure created when the plunger is pulled back; the tip of the feeding tube is not obstructed and the air naturally present in the trachea and lungs is pulled back into the syringe very easily. If you understand, master and perform this check every time you pass a feeding tube, you will never accidentally drown an animal while tube feeding. 10. 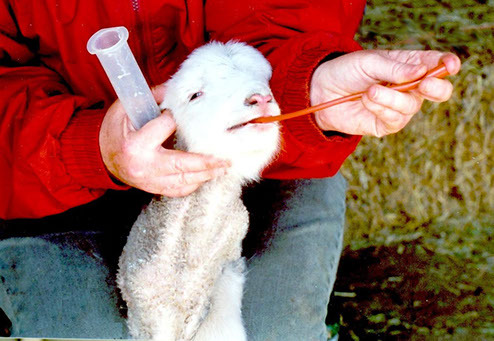 As shown in the photo, after the required amount of fluid has been administered, crimp off or plug the end of the tube as it is withdrawn from the animal; this prevents the animal from inhaling any fluid as the tube is withdrawn across the pharynx. An animal should receive at least 10% of its body weight in colostrum in the first four hours of life. This dose should be repeated in 12 hours for a total of 20% of body weight of colostrum within the first 24 hours of life. 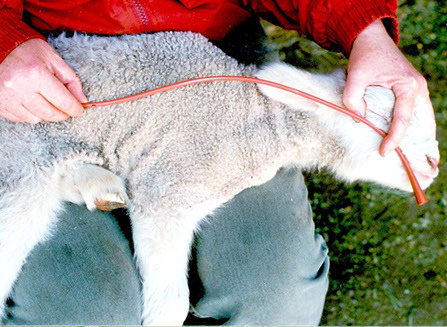 For example, a 10-pound lamb should receive at least one pound (16 ounces) of colostrum during its first four hours and a total of at least two pounds (32 ounces) in its first 24 hours. Two or three smaller meals are better for the neonate than one huge meal. If all goes well, the animal will only need to be tubed once, then can be returned to its dam to nurse free choice or be bottle fed. Animals that do not respond well or do not get stronger within a few hours should have a thorough physical examination. Johne’s disease, Brucellosis, mycoplasmosis, O.P.P., C.A.E. and other diseases can spread to your herd through infected colostrum. If you are using colostrum from another herd, be sure the source is disease-free or heat-treat the colostrum before use. It is a challenge to pasteurize colostrum without destroying its beneficial antibodies. The key is to keep the colostrum between 132.8ºF and 134.6ºF for 60 minutes, stirring constantly. To disinfect tube feeding equipment, rinse well immediately after use. Wash thoroughly with warm, soapy water to remove all debris. Dilute one ounce of bleach with 21 ounces of water and submerge all equipment in this solution for two minutes. Remove, rinse well, air dry and store in a clean place. Wash your hands well before and after tube feeding. 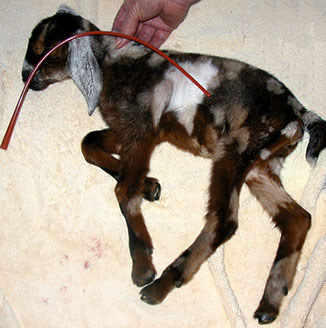 Review of the steps above will show that it is easy to learn how to tube feed neonatal small ruminants with confidence. Every sheep and goat producer should master this skill and have sanitized equipment and frozen colostrum ready during lambing and kidding season. 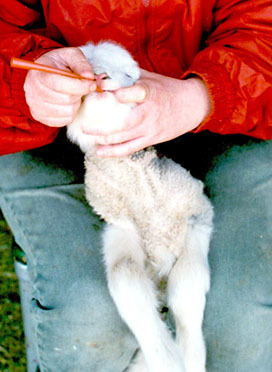 For assistance with learning how to tube feed or locating tube-feeding equipment, contact your veterinarian or county Extension educator.